will premiere on HBO on April 6th at 10:00 pm! 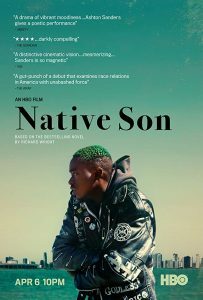 Native Son was chosen as one of the films which opened the 2019 Sundance Film Festival, and will premiere on HBO on Saturday, April 6th at 10:00 pm. Directed by Rashid Johnson, written by Suzan-Lori Parks, and produced by Matthew Perniciaro and Michael Sherman, Native Son is a modern retelling of Richard Wright’s classic novel. A young African-American man named Bigger Thomas takes a job working for a highly influential Chicago family, a decision that will change the course of his life forever. The cast is comprised of Ashton Sanders, Margaret Qually, Nick Robinson, KiKi Layne, Bill Camp, and Sanaa Lathan. When it filmed in Cleveland early last year, Native Son created over 100 jobs, with about 80 of those going to local crew! This film also employed over 200 extras, and engaged many local businesses.